I mean, I'm not saying that Colombia are out of this, they're a demonstrably excellent football team, but there are plenty of reasons to say that they've had a poor first half. ESPNFC.comThiago Silva's goal is the difference in a very open first half of play. BR how do you rate Maicon so far I think he has done well. Marsilio, his forward runs have been dangerous, but his touch is a little off. if james wants that real move he better earn it now!! Azeus- if anyone needs motivation just look at that crowd! I don't know if you've got this where you are, but we've got an advert for a mobile phone here that has Messi, Ronaldo and...erm...Rooney in some kind of body armour doing football tricks. I can't help thinking that both Messi and Ronaldo saw Rooney show up at the shoot and said, "Seriously? Him? He's here to get us coffee, right?" This is game much better than that drab Germany France game. Talking about General Zod, the game the character came from had just be remade and re-released. Bedude, can I come over when I finish work? Iain: I actually did a little research and Carlos Velasco Carballo hasn't issued a single card the entire WC. I don't think Brazil's passing has been all that. It is a repeat of Matuidi again. At least more than six fouls now and still not in the book. Birks, that's amazing. How has he managed that?! If the ref doesn't get control of the match, the 2nd half will be the same as the 1st. It favors Brazil for sure. If Colombia gets blown out 10-0 they still go home as heroes, with one of the best returns to the world cup of all time. SUB: Adrián Ramosis on for Victor Ibarbo, who was quiet. King Hames to step up this half!! Worst quarter final games ever...this one and the previous one ! Neymar looks out wide for Marcelo, but the pass is too long despite sliding for the ball. Adrián Ramos sets off down the left flank and Fernandinho shoves him over - goal kick given. The referee has been very, very lenient on the Brazil midfielder. Ian. Both choppy with lots of fouling. Did I really see jordans comment or am I drunk already? Yeah this Colombia team has made history and made their country proud. A look at each of the two young superstars' first half performances. Brazil has 6 players sitting on yellows. If you're wondering why the ref has kept his cards in his pocket, there's your answer. 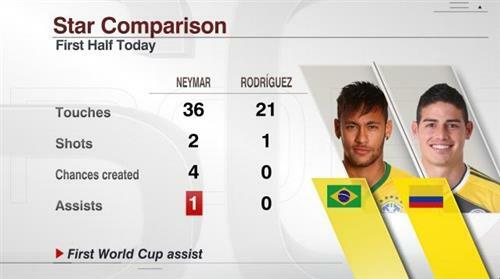 This Colombia team is good but none is getting in the way of a Neymar's vs Messi dream showdown. 48" - James Rodriguez goes down under a soft challenge from Marcelo, and wins the free kick. Another free kick as Hulk seemingly fouls Juan Zúñiga - this is a great area on the right to swing in a dangerous cross. How many fouls in this game so far? Cuadrado puts in the delivery, but Thiago Silva heads away again. Aren't yellows wiped after this?